This page is for all those sailors and armchair sailors. We had some interesting weather from Cochin, India to Djibouti (generally light instead of advertised NE 10-15 kts., and either very light or heavy in the Red Sea and Gulf of Suez. work, and had to think of coach Peter several times to get up it. had almost given up on the old customs of the sea to help another vessel. they thought it was the cavalry coming over the hill to save them. did want to move along to clear the next set of traffic lanes before dark. was supposed to come in about 1930, so we left all our lights on for them. problems, and could not make the anchorage, despite our coaching on the VHF. try again in the morning. for six hours to get up to the anchorage on Great Hamish. down, but managed to not drag on the third try. unfortunately left her dink trailing off the stern and the dink had flipped. by us and then puttered down toward TAHLEQUAH when his engine quit. left with 30-40 with higher gusts, much like we did. picking up any sea. We were not looking forward to those conditions. reaching, but not when beating). But with the jib in hard, we pointed well. Leeway was a bit higher because of the waves, but our net VMG was good. Oyster 55 is shaking fillings out of the owner's teeth. NW, we figured we would be a bit to weather. able to get out of some of the seas, and we made Hurghada by 1600 or so. miles to Abu Tig Marina, where we now sit and recover. weather window, if we can find it, when the wind is down, and we can motor. I is only 180 miles from El Gouna to Suez, at the S end of the canal. But the Gulf of Suez is narrow, with shipping channels for all the Suez Canal traffic, and most of Egypt's oil and gas is pumped from platforms scattered around. The wind tends to blow from the N, and the seas are even shorter and steeper than in the Red Sea. In the south, there is a significant tidal stream (1.5 -2.5 kts), meaning you get wind against (a fair) tide to stand the seas up, or just plain steep seas with tide setting you to leeward. In any case, progress is slow at best. When the wind blows over 25 kts it is punishing for the boat and crew. At any rate, about 5 pm we were coming up to El Tur, one of the few good anchorages in Northers, so we took it. We did not think we had rested crew to sail all night, considering the fact that we needed at least two on deck at all times, with the steering, the lookout for oil wells and other vessels, and the navigation. A good move, as it turned out. We had made 50 miles from El Gouna. We anchored in about 20 feet of water in El Tur, an anchorage with a large military presence, and a windsurfing and windkiting school. Because of the military, we were not allowed to go ashore, so we tried to entertain ourselves with paperwork, weather reports and maintenance, plus the occasional card game or RummyKube game. The next day, conditions appear even worse, up at least five knots over the prior day, and still dead on the nose. Early on, SAFARI (58 ft catamaran) shows up, and Ivor reports they experienced the worst part of their whole rally for the last 50 miles from Sharm-el-Sheik to El Tur. The following morning, SAFARI takes off, and things look up a bit. Around noon, we get the anchors up and motorsail out under double-reefed main. After about an hour though, the wind is over 32 over the deck, and the steep seas make the project worse than the day we put in. Net net, we turn around and were back in two hours or so. Later, SAFARI reports that conditions were worse, and they put into shelter in a cove with marginal holding (which was too far for us to make in daylight anyway). That day, four boats (none rally boats) who had left El Gouna or points south put in to El Tur for rest too. That night, I woke up to ... silence in the rigging. There was no wind in the anchorage. I could hardly sleep, like a kid at Christmas, and at first light we found 2 knots of wind from the SE. But the seas did not appear to have gone down, and the surf was crashing on the other side of the point protecting our anchorage. But we got up and going ASAP, and were soon motorsailing out with one reef for security. Sure enough, the surf report was right, and a mile out of the anchorage it was blowing 22 out of the north with the same short seas, and blowing 27 (true) another mile out. With gusts of 35 over the deck, we turned tail and ran home. Later we figured the wind had clocked just a bit, allowing the mountains around us to provide shelter and a lee that gave us a totally false impression of easing winds when we were inside. 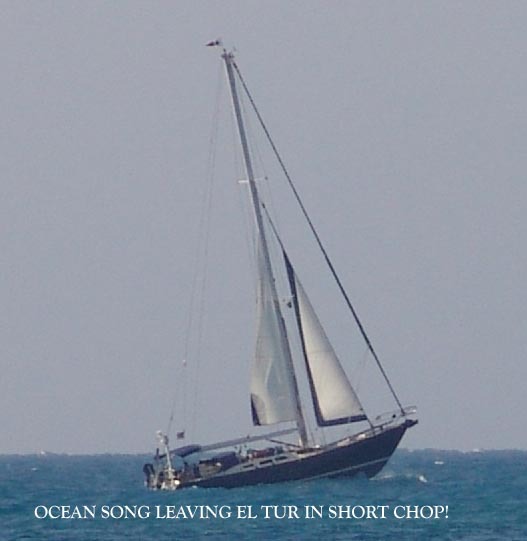 Later that day, OCEAN SONG (fifty feet of steel cutter, just the boat for seas like this) came into the anchorage, having been the only boat to leave El Gouna on the schedule date. They too, had spent the day bashing to windward with traffic and hazards, and decided not to try the rest of the way at night, with navigation, shipping and steering and sail handling issues. The next morning, it was light air again, but we knew better - the surf was still up. OCEAN SONG decided to "have a go at it" and left soon after dawn. They spent all day bashing their way 18 miles up, and then running back to El Tur when the marginal anchorage they thought might be okay actually had surf breaking across it. In additon to their anchoring again, we also had a large (80-90 foot) motor yacht hide out. Little El Tur, which rarely has one non-local boat anchored in it, suddenly had seven! By this time we were getting low on fresh food (we had left with a one- or two-day passage in mind), so Leslie negotiated with the wind-surfing school/resort to get two chickens and some veggies sent out to the boat (we still can't get off!). We did have many hard stores, but Leslie likes us to eat fresh if we can. Finally one week from the day we arrived, the weather forecast and the visual conditions agreed... the wind would be light, albeit from the North. By dawn most of us were ready and we took off from El Tur! The majority of the rally boats, who had been pinned down in El Gouna, also took off for Suez. We made the best time we could, motoring in light airs. The Gulf of Suez had one last go however. About 10 pm, the wind came up to 22-25, so we had 30 across the deck again. 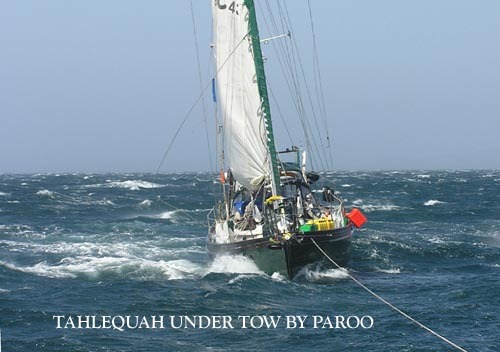 However, the seas did not get up too fast, and the wind dropped 10 kts around midnight. Some of the other boats farther south got hit with these winds longer, so almost all boats had to pay dues to the Gulf of Suez wind and wave gods, even during the best weather for two weeks. By 0400 the next morning, we anchored off the Suez Canal entrance in zero wind. We motored around to the Suez Canal Yacht Club at 0530 to beat the first northbound canal ship convoy. Of course, two days later, there were strong southerlies. Good too, as NADEMIA had been trapped much farther south in Egypt than the rest of us, and made it up the Gulf of Suez in the quickest time of all the boats (she is one of the smallest boats). The southerlies lasted only two days, when stronger northerlies returned!